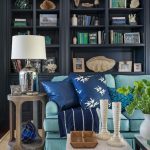 If you love color as much as me, you must check out the book Colors For Your Home – 300 Designer Favorites from the editors of House Beautiful Magazine. I’ve seriously been so inspired since receiving it in the mail. More importantly though, I’ve never felt so confident in choosing the perfect shade of paint! The handy-sized book is filled with great info and amazing pictures (and lots of color…real paint swatches!) You can easily find your perfect color by room, shade, designer, mood and more. I had no idea that a turquoisey Aruba Blue 2048-30 from Benjamin Moore is approved as a “Color Men Love”! 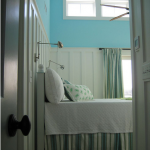 It’s no surprise though, Seafoam Green 2039-60 will give your room a sunny feeling. And get this, one of my favorite shades, Cool Aqua 2056-40 can be used as a quick color fix. 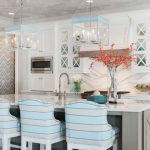 So if you’re looking to paint a room, or just like looking at pictures of pretty rooms (lots, lots more than just these pretty blue ones above…), you won’t be disappointed in Colors For Your Home. 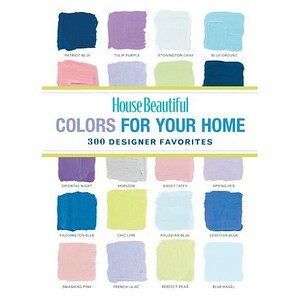 There are over 300 tried and true colors in this book that were all beautifully used in real homes by real interior designers. So much inspiration in a book that fits in your purse and costs less than a gallon of paint! If you’re interested, here are the links to it on Amazon and Barnes and Nobles. I truly love your site.. Great colors & theme. Did you develop this amazing site yourself? Please reply back as I’m planning to create my own site and would like to learn where you got this from or exactly what the theme is called. Appreciate it!